Faithful supporters of the Santa Cruz Symphony under the direction of Music Director Daniel Stewart were treated to rare, innovative programming, in a special sixth concert of its 2016-2017 season featuring Yuja Wang — certainly one of the most sought after pianists in the world. In her first performance with the Santa Cruz Symphony in February at Civic Center and Mello Center Wang created a sensation performing the Concerto No. 5 by Prokofiev and Concerto No. 2 by Johannes Brahms. Subsequently. it was Yuja Wang who having enjoyed her first Santa Cruz appearances who suggested this special return engagement. This second set of concerts featuring Yuja Wang, heard on Saturday, June 24 at Civic Center and at Mello Center on Sunday, June 25, reflected a well thought out counter point to the February concerts. 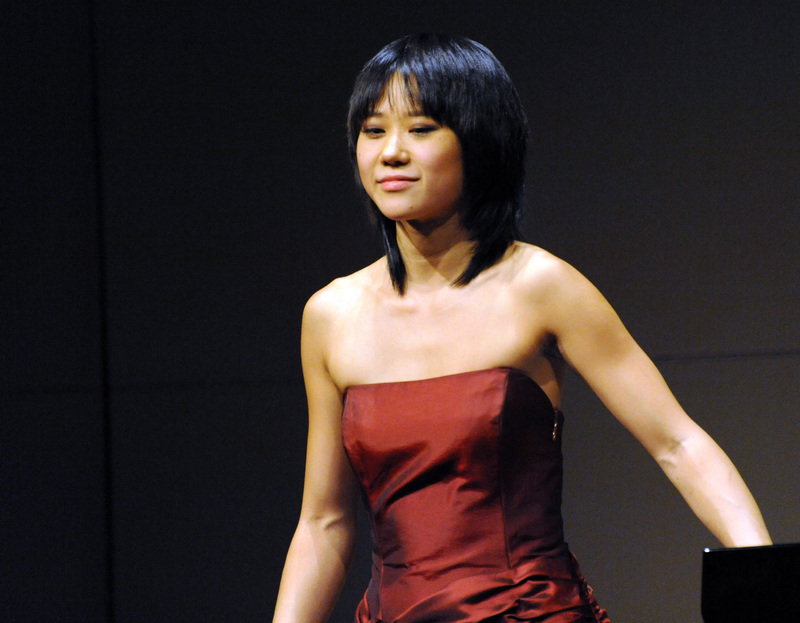 The two concertos performed in this second series of concerts by Yuja Wang were Beethoven’s Concerto No. 1 in C major, Op. 15 and Brahms’ Concerto No. 1 in D minor, Op. 15. Beethoven’s Concerto No. 1, composed and performed in 1795 with Beethoven as soloist, was revised in 1800. The dedication went to his pupil Princess Anna Louise Barbara Odescalachi, known to her intimate friends as “Babbette.” Beethoven’s concerto No. 1 was actually his third attempt at composing a piano concerto, but in order of publication, it became known as his first concerto for piano. We were hearing Yuja’s first performance of both the Beethoven Concerto No. 1 and the Brahms No. 1, for both these concertos are new to her repertoire. I had the distinct pleasure of attending the rehearsal on Friday prior to the concert at Civic Center. What became visibly clear was the intense attention to detail on the part of both Stewart and Yuja Wang. On several occasions during the rehearsal Stewart paused the orchestra to discuss delicate points of musical interpretation and then cued orchestra members to insure perfection. Of special interest was the attention to gradations of dynamics as well as precise adjusting of balances between orchestra and soloist. These points were rehearsed until perfection was achieved, much to the satisfaction of the entire orchestra. In true Yuja style, she entered the stage at Mello wearing an attractive lime colored dress detailed to perfection. Throughout the performance Yuja’s phrasing was fluid and expressive with attention to dynamic gradations that added color to the orchestral texture. Her elegant solo opening of the second movement was noteworthy and hinted at Mozartian delicacy. This was followed by the winds adding yet another layer of sound that colored the trills as they worked their way up the keyboard. The third movement, designated Rondo – Allegro scherzando, falls into the traditional seven-part rondo form (ABACABA) that offered a variety of key changes and orchestral and solo piano colors to the work. One rhythmic section offered striking rhythmic/dynamic contrast and suggested what a German Tango might sound like. Of particular interest in Yuja Wang’s performance of the Beethoven Concerto No. 1 was the cadenza composed by Glenn Gould (read from the score) that provided a huge surprise to the audience expecting to hear one of the three original Beethoven cadenzas. Overall, Yuja Wang’s playing of this concerto displayed a flawless sense of the music’s ebb, flow and surge with exquisitely tapered phrasing. The performance left the audience with a feeling of freshness, perhaps due the fact this was the first time Yuja had performed this delightful concerto. After intermission, Yuja came out on stage in a new gown, this time black with green sequins. The Brahms Concerto No. 1 opened with what could be considered intense Sturm und Drang and quasi-violent emotional agitation. After the extended orchestral introduction the beautiful main theme entered that foreshadowed the impressive emotional abandon, tempered at times by eloquent restraint of tone and dynamics — all perfectly coordinated under the baton of Stewart. In the second movement, an eloquent and moving Adagio, Yuja demonstrated a sense of natural, refined technique that produced lavish color and subtle nuances. Coincidentally, the third movement is also designated Rondo – Allegro non troppo. Both the orchestra and soloist displayed ferocious temperament, brilliant virtuosity and poetic soul. The intensity of Yuja’s octave passages was simple awesome. The orchestral families and solo moments in the horns, winds, brass, timpani and double basses created a wonderful backbone and were performed with brilliance, BRAVO! The audience was treated to two encores. The first was Horowitz’s famous arrangement of the Carmen Fantasy (with some of Yuja Wang’s own wizardry added) and finally a gentle and lovely performance of the Schubert/LisztGretchen am Spinnrade (Gretchen at the spinning wheel). Both Maestro Stewart and Yuja Wang are impressive musical talents. Santa Cruz audiences will not be surprised to see them performing together again! Archived in these categories: Classical Era, Orchestral, Piano, Romantic Era, String quartet.